The JavaFX Scene Builder 2.0 Early Access is an early view of the next version of the JavaFX Scene Builder product. It is a design tool for the JavaFX 8 Early Access platform and can assist you with the visual layout of an application's user interface that is linked to the application logic. You simply drag and drop graphical user interface (GUI) components onto a JavaFX scene and the FXML source code for your layout is automatically generated. The Java Scene Builder 2.0 Early Access release adds support for the JavaFX 8 Early Access platform, as well as important new features and usability improvements from the Scene Builder 1.1 release. This release also brings a major refactoring of the JavaFX Scene Builder architecture and code base in order to break down the Scene Builder tool into components that can be directly integrated into a larger application, such as an IDE. While certain new features, such as the ability to import third party GUI components to the Library, are already available in this Preview Release, other features that are available in the previous Scene Builder 1.1 release are still currently work in progress. Also, note that the Scene Builder tool's look and feel is not final with this Early Access release. It is currently very close to what the brand new JavaFX 8 Modena theme can bring to your own application out of the box. The bulk of the CSS work, which is giving Scene Builder its own visual personality, is usually done towards the end of the development cycle. JavaFX Scene Builder Kit (New since build b05). JavaFX Scene Builder Kit is an API that allows the integration of Scene Builder panels and functionalities directly into the GUI of a larger application, or a Java IDE, such as NetBeans, IntelliJ, and Eclipse. See Working with the JavaFX Scene Builder Kit for more details. Ability to add custom GUI components to the Library (Updated since build b07). Custom components imported from a third party JAR file can now be added permanently to the Library of available GUI components. As of build b07, you can use the updated Import dialog to add either an FXML file or select specific usable components in a JAR file to add to the Library. Use the Import JAR/FXML file command from the Library panel's pull-down menu. Drag a third-party JAR or FXML file from either the Desktop, the Hierarchy panel, or the Content panel, and drop it into the Library panel. After each new component is added, a new entry is created in the Custom section of the Library panel. The new entry is named using the component's top level Java class name followed by “_<i>", where <i> is a unique number. For example, if you drop a Button component from the Library panel to the Content panel, set its properties, and then drag it back to the Library panel, a new entry named Button_1 is added to the Custom section of the Library panel. Support for new JavaFX 8 UI components (New since build b05). The new UI components, TreeTableView, DatePicker, and SwingNode, that were introduced in the JavaFX 8 Early Access platform are now supported in Scene Builder 2.0 Early Access. They are available via the Library panel. The SwingNode component will be treated as a leaf component. To get a list of the JavaFX 8 UI components that are available, type “FX8“ in the Library panel's Search textfield. 3D Support (New since build b05). FXML documents containing 3D objects can now be loaded and saved in the Scene Builder tool. You can view and edit properties of the 3D objects using the Inspector panel (Material and Mesh complex properties are not yet supported). You can not, however, create new 3D objects using the Scene Builder tool. Support for Rich Text (New since build b05). A new container, TextFlow, is now available in the Library of GUI components. You can drag multiple text nodes and other types of nodes, into the a TextFlow container. You can also directly manipulate the text nodes to re-arrange them in the container. Inline and property editing features are also available for each text node. Library Panel Improvements. The default viewing option for the Library panel is now a new feature that gives you the option to view all the component categories as collapsible sections. Content Panel Improvements. You can now manipulate the components of an HBox or VBox container directly in the Content Panel to re-order them. You can also insert a new component at any position in the container. Note that this direct manipulation is currently not available for FlowPane, TilePane or Toolbar containers. Inspector Panel Improvements. Many property editors in the Inspector panel use the Suggested List pop-up dialog window, which displays a list of selectable values (such as style property values) from which you can make a selection instead of manually entering the values. The CSS Style editor provides a list of applicable CSS properties, based on the object(s) currently selected component. List handling has also been simplified. In addition, the usability of many of the property editors, such as AnchorPane Constraints, Rotate, and Padding, have been improved. Preview Window Improvements. The content in the Preview window is now automatically refreshed as the current FXML document is being edited. Hence, there's no need to use the Refresh command in order to preview the modified UI layout. Ensure that your system meets the system requirements in the current JavaFX System Requirements document listed on the JavaFX Release Documentation page. JavaFX Scene Builder 2.0 Early Access release supports the same platforms that are listed in JavaFX Certified System Configurations, including Linux and Mac OS X 10.8. There is a 32-bit or 64-bit JavaFX Scene Builder available for the Linux platform. Use the bit version that matches that of your OS installation. To successfully complete the JavaFX Scene Builder Getting Started tutorial, it is highly recommended that you also install the following software. However, there are also instructions in the JavaFX Scene Builder Getting Started tutorial that guide you to complete the tutorial using JavaFX Scene Builder and the ANT utility only. The Getting Started tutorial is based on the JavaFX Scene Builder 1.1 release. As such, it cannot be followed as is using the Scene Builder 2.0 Early Access due to current functional limitations in this milestone release. Latest NetBeans IDE 7.4 software to utilize the tight integration with JavaFX Scene Builder to create a new FXML file, edit it using JavaFX Scene Builder, modify your Java controller source files, compile them, and run the sample application used in the tutorial. Download the NetBeans IDE 7.4 software from https://netbeans.org/downloads/. The JavaFX Scene Builder is available as an .msi file for the Windows platform, as a .tar.gz or .deb file for the Linux platform, and as a .dmg file for the Mac OS X platform. Go to the JavaFX Scene Builder Early Access Download page at http://www.oracle.com/technetwork/java/javafx/downloads/devpreview-1429449.html. In the JavaFX Scene Builder 2.0 section, click the link for your operating system and follow the prompts to save the installer file. Use the following information to install in your specific platform. javafx_scenebuilder-2_0-ea-<build#>-windows-<build-date>.msi installer file. Respond to the prompts as indicated in the installation wizard. C:\Program Files\Oracle\JavaFX Scene Builder 2.0 on a Windows platform. If you install JavaFX Scene Builder on a 64-bit Windows machine, the default installation location is C:\Program Files (x86)\Oracle\JavaFX Scene Builder 2.0. (Linux platform) Extract the Scene Builder 2.0 Early Access files from the javafx_scenebuilder-2_0-ea-<build#>-linux-<platform>-<build-date>.tar.gz to a directory on your local file system, or double-click the javafx_scenebuilder-2_0-ea-<build#>-linux-<platform>-<build-date>.deb file to open it with Ubuntu Software Center, where <platform> is either x64 or i586. The default installation directory is /opt/JavaFXSceneBuilder2.0. javafx_scenebuilder-2_0-ea-<build#>-macosx-universal-<build-date>.dmg file and drag the JavaFX Scene Builder 2.0.app application into the Applications folder. For any of the supported platforms, the installed software contains the files similar to or a subset of what is shown in Figure 1, which shows the installation layout on a Windows platform. 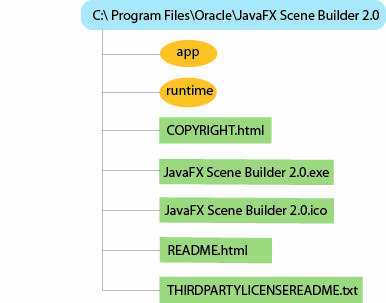 Description of "Figure 1 Contents of a JavaFX Scene Builder 2.0 Installation on a Windows Platform"
/app - Contains the JavaFX Scene Builder properties files and libraries. /runtime - Contains a copy of the JavaFX Runtime executable files and libraries that enable JavaFX Scene Builder to run standalone. COPYRIGHT.html - Contains the copyright information for JavaFX Scene Builder. JavaFX Scene Builder 2.0.exe - JavaFX Scene Builder executable file. JavaFX Scene Builder 2.0.ico - JavaFX Scene Builder icon file. README.html - Contains a pointer to the JavaFX Scene Builder README page. THIRDPARTYLICENSEREADME.txt - Contains the list of third-party licenses. To get started getting familiar with Scene Builder, read through the following documentation that can be found at http://docs.oracle.com/javafx/. The following documents are based on JavaFX Scene Builder 1.1 release. You may also view the Getting Started with JavaFX Scene Builder video tutorial, which shows the steps to create the same FXML file for the simple issue tracking application sample. The following limitations are known to exist with the JavaFX Scene Builder 2.0 Early Access release. Some of the menu and menu commands that are available in the Scene Builder 1.1 release are not yet available in this early access version of Scene Builder 2.0. Direct manipulation of the content of certain containers, such as BorderPane, is not yet available in the Content panel. Some of the property editors are not yet available in the Inspector Panel. DTL-5924 - If a version of the JavaFX Scene Builder 2.0 Early Access is already installed in your system, you will be unable to install Scene Builder 1.1 unless you remove the Scene Builder 2.0 Early Access installation first. You can, however, install Scene Builder 2.0 Early Access if you have Scene Builder 1.1 already installed. (New since build b07) DTL-5940 -The content of the Preview window is never refreshed. (New since build b07) DTL-6001 - The content of the Preview window does not reflect the CSS stylesheets referenced by the opened FXML document. The javafx_scenebuilder_kit_javadoc-2_0-ea-<build#>-<build_date>.zip file, which contains an API javadoc for the JavaFX Scene Builder Kit. You can download the zip file from http://www.oracle.com/technetwork/java/javafx/downloads/devpreview-1429449.html. The javafx_scenebuilder_kit_samples-2_0-ea-<build#>-<build_date>.zip file, which contains the SceneBuilderHello sample application that shows a minimal Java source code example of how the Scene Builder Kit API can be used. This sample is delivered as a NetBeans project. It can be downloaded from http://www.oracle.com/technetwork/java/javafx/downloads/devpreview-1429449.html.